But even after all this rain, don't think for a minute that I'm going to start taking a bath every day. Oh, I didn't mean that either. What I do mean is that even after all this rain, the water that we, and our plants, drink, is still a scarce resource. And there are no better plants for sipping that precious water slowly than some of our own California native bulbs, bushes and trees. From formal gardens to cottage gardens, children's gardens to edible gardens, you can—and should—choose your own (native garden) adventure this spring. Choose a spot in full sun that is weed-free, with soil that is moderately well draining. No need to redo your entire yard at once. It's OK to start with one small area. Consider adding a natural arrangement of attractive boulders and rocks. If you are handy enough to install one yourself, or able to pay a professional, include a basic drip irrigation system (before planting.) Otherwise, give your plants a deep soak when you plant them, with additional monthly deep soaks. Watch for heat waves in the forecast, giving them additional water a few days before any hot weather event. Once your plants are in the ground, remember to keep the weeds to a minimum or they will compete for your California natives' resources. Avoid using pesticides and choose hand weeding instead, which is a built-in opportunity to check soil moisture levels and identify pests and disease in their earliest stages. For more information about creating a pollinator garden, check out the Xerces Society's “Bring Back the Pollinators” campaign. This article first appeared in the April issue of the South Valley Magazine. 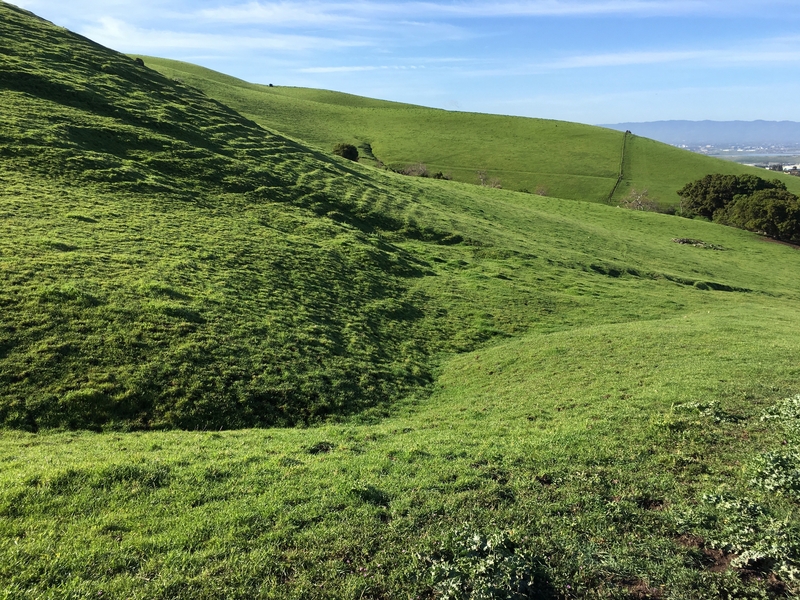 In one of the wettest winters in recent memory, South County gardens and landscapes have received about as much rain as they can handle — and then some. One way to reduce topsoil loss, protect plants, and hang on to some of that precious water is with a rain garden. A rain garden is a sunken area that redirects rain water away from buildings, driveways, lawns and other landscape features, and holds onto that water long enough to filter out 80 percent of the sediment and pollutants. Native plants are typically installed in rain gardens so that additional irrigation is not needed once they are established. These plants help hold, filter and slow the release of rainwater, allowing 30 percent more water to be absorbed. This usually occurs within 48 hours, preventing mosquito breeding. If you live South County, you know our occasional rains can be disruptive. Our soils dry to the point of being hydrophobic, repelling water and causing flash floods. You may not have experienced a flash flood in your yard, but these principles can help prevent the loss of topsoil and other problems associated with urban drool. Also, most of the water that comes off roofs and driveways contain pollutants that you probably don't want in your garden. Installing a rain garden also helps attract beneficial insects and other pollinators, increasing biodiversity. 1. Calculate size — South County's heavy clay soil requires a drainage area 45 to 60 percent of the size of your roof or driveway — sandy soil only needs 20 percent and loam uses 30 to 35 percent. Any size rain garden can have a positive impact. This may be more space than you have or are willing to dedicate, but it may help you realize why certain areas of your landscape seem plagued with fungal diseases. Since most homes have multiple downspouts, smaller rain garden plots can be created for each downspout. 2. 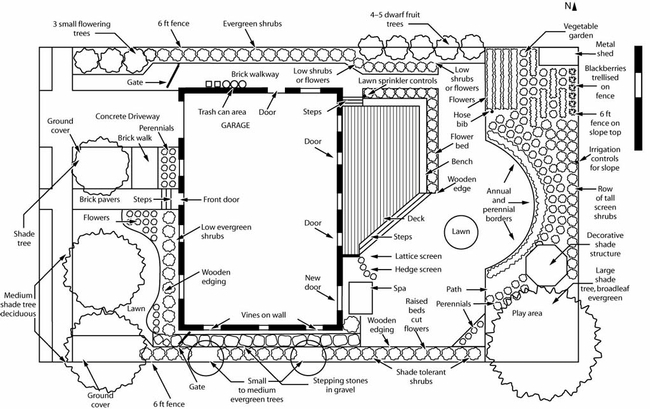 Design the shape — Once you have determined how much area you are dedicating, use a rope or garden hose to lay out the design. This lets you play with different ideas before you start digging. A Google Maps satellite image of your property can also help you select the best location and shape. Consider where any overflow might end up, just in case. Once you have selected a location and shape, contact the local utilities company (call 811) to make sure you won't run into something you shouldn't. 3. Start digging — After you've been cleared and your soil has dried out from all the recent rain, you can start digging. Begin by removing 6 to 8 inches of soil from the rain garden site, sloping downward away from the trench. Next, dig the trench. The trench will need to slope for the water to go where you want it. The trench can be covered, like a French drain, or it can be filled with decorative river rocks. Finally, amend the planting area by digging in 2 or 3 inches of aged compost. 4. Select the plants — Native grasses and flowers are the best choice for a rain garden. They have already evolved to handle south county rain, temperatures, and soil. U.C. Davis Arboretum All Stars, the CA Native Plant Society's Plant Lists, and your local Master Gardeners are always available for plant selection advice. 5. Install the plants — While still in their pots, try placing plants in various locations to see what looks the best, keeping mature sizes in mind. Grouping plants in odd numbers often looks the best, but leave at least one foot between each plant. Once you have the layout you want, put your new plants in the ground using a hand trowel. 6. Mulch and water — Contact a local tree trimming company for coarsely shredded wood chips. 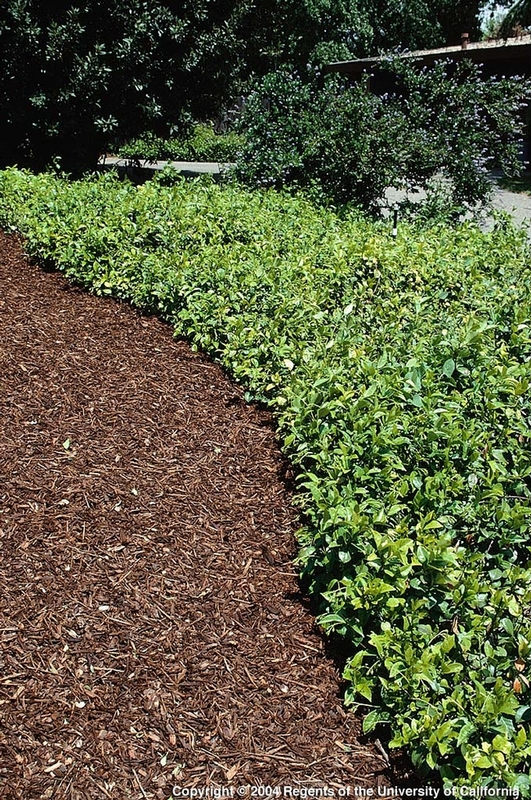 This highly useful mulch is almost always free, just make sure that it is disease- and palm-free. Apply a 2 to 3 inches layer to keep down weeds and make it look nice. Water the area every other day for the first couple of weeks, unless it rains, until your new plants are established. They may need additional watering during their first summer, but that should be about it. This is a big project, but it is one that will improve soil and water quality in your South Valley home's landscape for a very long time. You can learn more about garden design at the South County Teaching and Demo Garden at St. Louise Hospital, 9400 No Name Uno Way, Gilroy. Classes are regularly offered to the public. For more information, check our events page or call (408) 282-3105 between 9:30 a.m. and 12:30 p.m., Monday through Friday. Photo: Stacey Parker, UC Davis Arboretum and Public Garden GATEways horticulturist, points out the new rain garden feature of the Davis Commons Shopping Center parking lot. 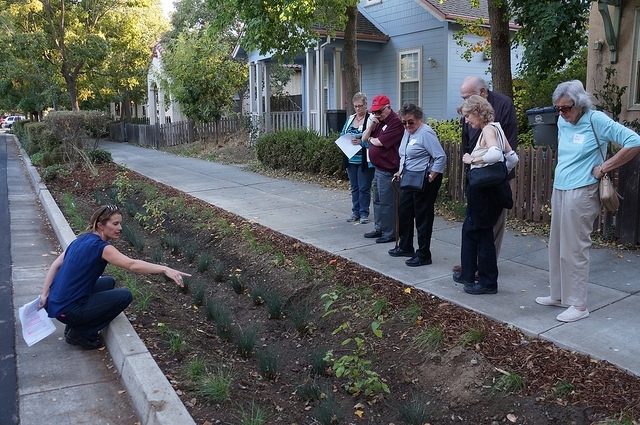 Guests learn how the feature will improve stormwater management. From publicgardens.ucdavis.edu website. This article first appeared in the March 29 to April 11 issue of Morgan Hill Life. 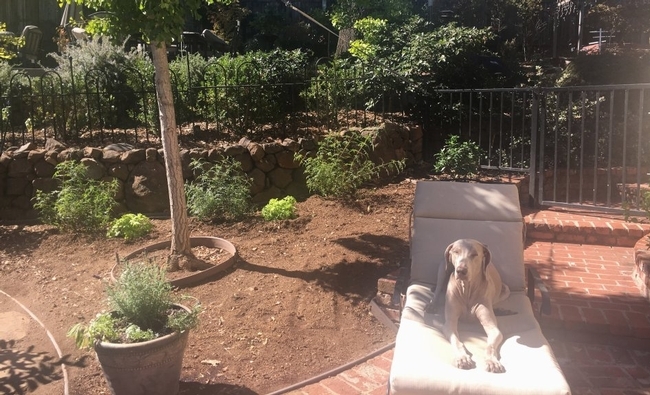 Planting may be the last thing on your mind in August, but it is an excellent time to pour an iced tea, take a seat in the shade, and look at a garden or landscape with an eye to the future. Spring's pale greenery and brilliant blooms are behind us. Morgan Hill's hot, dry summers are providing a wealth of tomatoes, peppers, cucumbers and melons. But fall and winter are not far off. How will a garden design look and perform then? Planting with a long term view can increase biodiversity and pollination, while reducing weeds, pests, and erosion. It also makes a landscape look lovely every month of the year. A few sheets of paper and a garden book or two can help you create a year-round garden design. Begin by drawing a rough draft of an area. Next, pencil in existing perennial plants, structures, lawns, and walkways. Everything else is fair game. Color code the garden design to include sun and wind exposure, access to water, mature plant height, and color to create a workable garden design. This will also help select the best plants for each spot. Also, water use can be significantly reduced by planting varieties with similar water needs together. Put taller plants against a fence, medium-height plants in front of those, and then shorter plants closest to walkways. This makes full use of available soil without blocking anyone's view. Garden books, online resources, and your local Master Gardeners can help you select plants that will provide flowers, food, and greenery for each season. As one season's plants wind down, the next season will be coming in, providing year-round food and color. Containers, vertical gardens, and raised beds offer extra growing space and extend the growing season. Morgan Hill weather makes it possible to grow edible and ornamental plants year-round. Cool season greens and cruciferous vegetables prefer our winter and spring. Potato plants offer greenery in the landscape from spring to summer, and potatoes in the fall. Perennial edibles, such as asparagus, fruit trees, bramble fruits, grapes, kiwi, and rhubarb are excellent anchor points in a landscape. Ornamental plants can provide many different shades of green, along with other colors. In honor of Lily Hardy Hammond's 1916 book, In the Garden of Delight planting it forward also means adding plants that can be gifted to others. Succulents are durable in drought-prone Morgan Hill and they nearly propagate themselves. Cosmos and marigolds go to seed easily. Those and other seeds can be collected and planted as gifts to family and neighbors. They also make welcome gifts to individuals in hospitals and retirement homes. Melon and squash seeds can be started in small pots and gifted to neighbors and local charities. Learn when to plant edibles for year-round food for your family in Morgan Hill. For more information and classes, check our events page or call 408-282-3105 between 9:30 a.m. to 12:30 p.m., Monday through Friday. This article first appeared in the August 17 issue of the Morgan Hill Life.